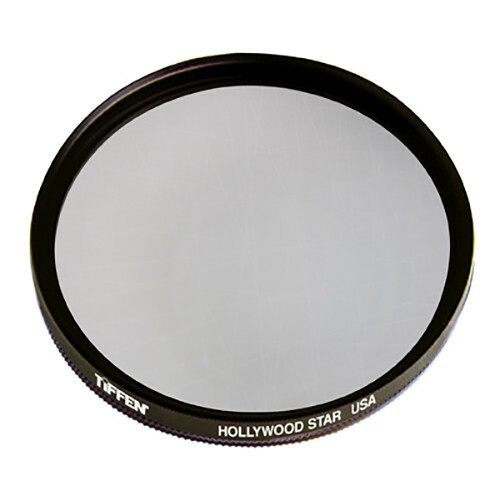 The Tiffen 77mm Hollywood Star Filter is designed to be used perpendicular to a point light source such as the sun, a light bulb, or a candle. Within the filter's surface is a combination of fine, etched line types. Those lines help to create a starburst effect with 14 asymmetric primary diffraction spikes that extend from the light source and are arranged in a pattern which approximates a cross. This filter is most effective for pictures where the light source used to generate the starburst effect is a highlight with a significant degree of contrast from the rest of the image. It is constructed from optical glass for clarity as well as color fidelity, and features an aluminum-alloy filter ring that can be rotated in order to adjust the direction of the diffraction spikes and overall orientation of the starburst effect. 77mm Hollywood Star Filter is rated 5.0 out of 5 by 1. Rated 5 out of 5 by GaryM2 from Great Look Unlike other star filters that provide a uniform more sterile look, this filter provides a softer more natural burst and because the bursts are not parallel, each one varies a bit in intensity. There are times when it also adds an almost prism like effect where it extracts colors from a white light. Sometimes that's good, other times not so much, but the unique look provided is quite pleasant and for the right situation, can't be beat.